Out of Bryant’s Personal Collection. This pen is used, and does show slight signs of use, but not much. Its in excellent condition. It has a Broad nib modified to a beautiful stub by Mike Masuyama. 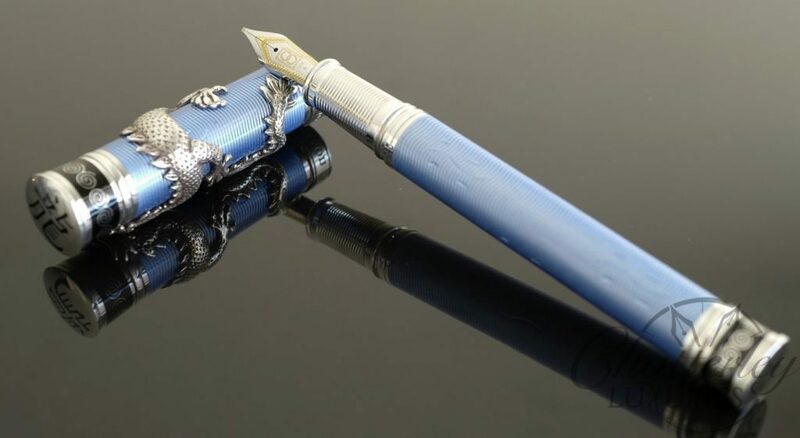 The Black Water Dragon is the eighteenth in the David Oscarson™ series of Limited Edition Writing Instruments. 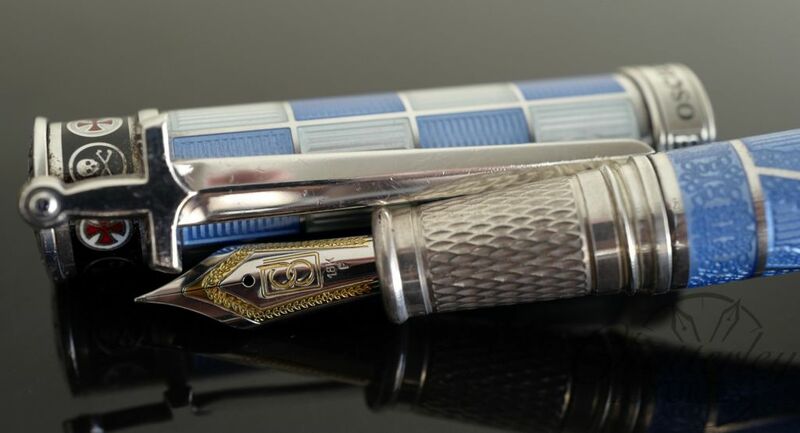 Produced in two primary color variations, each will be limited to production of 88 pieces (including Fountain Pen and Roller Ball styles). This particular color was made exclusively here, and there are only 3 of these in the world. This one is numbered 3/3. Dating back to 3000 BC, the Chinese Dragon is the ultimate symbol for good fortune. It is also a symbol for power, happiness, immortality, procreation, fertility and activity. While mythical in nature, the Dragon is revered as the most sacred of animals, possessing divine power to cause rain and thunder, to control floods and to rule over lakes, rivers and seas. The Chinese proclaim themselves “Long De Chuan Ren” (Descendants of the Dragon) and throughout the ages the Dragon has been portrayed as the symbol of the Chinese race. The Dragon was appropriately used as the symbol on the national flag of the last feudal Dynasty, the Qing Dynasty. Often depicted playing with a precious pearl, the Dragon can ward off wandering evil spirits, protect the innocent and bestow safety to all that hold his emblem. The Year of the Dragon takes place every 12 years. According to the Chinese calendar, 2012 is a strong Water year. Since the color of Water in the Chinese Astrology Five Elements System (Metal, Water, Wood, Fire and Earth) is related to Black, 2012 is a Black Dragon, Water Dragon or more precisely a Black Water Dragon year. The Water Dragon is less selfish and opinionated than the other Dragons. He is more inhibited and less power-hungry. He makes a good negotiator as he knows when, where and how to apply pressure. He also has a tendency to be overly optimistic. In Chinese mythology, everything connected with the Dragon is blessed. The Dragon looks like a snake and has no wings, although it is believed that he can fly. Each of the Dragon’s four short legs has five toes. The Dragon is unpredictable and untouchable and his head and tail cannot be seen at the same time. Dragons live under the surface of the earth and only visit the world in the second month of the Chinese calendar. The Black Water Dragon incorporates multiple levels of Guilloché engraving and a combination of translucent and opaque Hard Enamel. 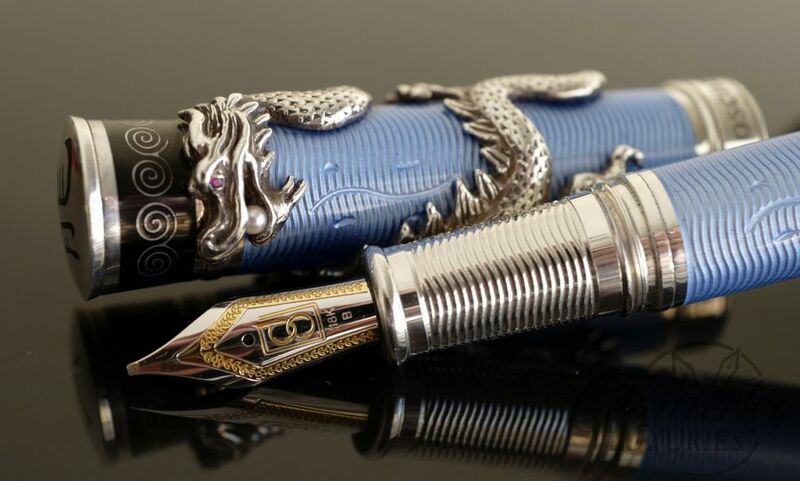 The entire body of each pen is first cut down to the level of the background, leaving the ancient Chinese symbol for water in either a mid or high relief. Translucent and Opaque Hard Enamels are repeatedly kiln-fired and filed by hand, resulting in the beautiful and enduring finish of true Hard Enamel. 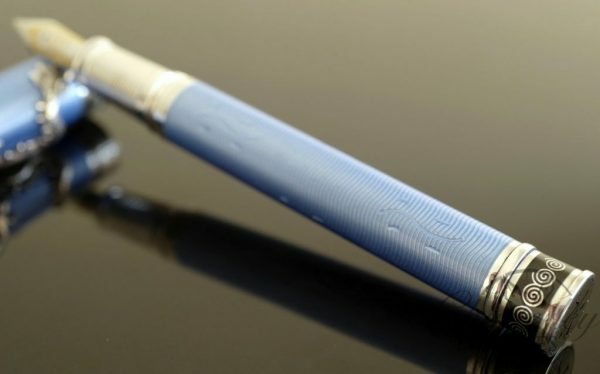 This pen utilizes a cartridge convertor or eye dropper filling system. 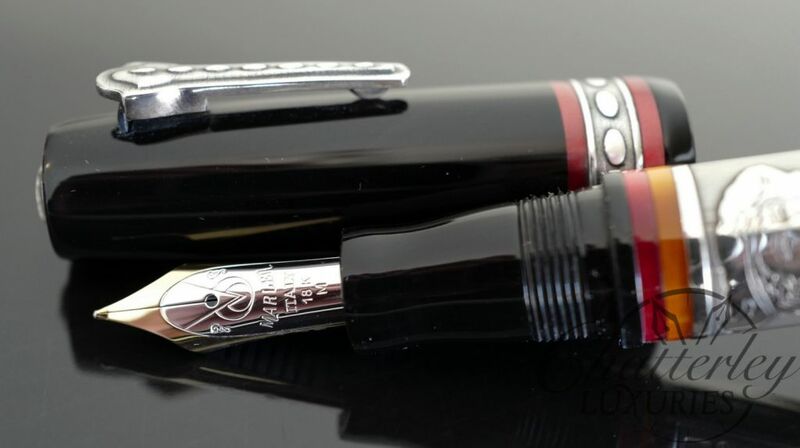 It is equipped with a Medium 18kt gold nib, other nib grades are available and if you prefer a different nib grade please contact us at info@chatterleyluxuries.com for nib choices.